This is a lovely George 111 pap boat made in London in 1770 by Robert and David Hennell. It is in very good condition, Good hallmarks, it is 10cms long and weighs 60grams. A fine 18th century pap boat. Lovely Victorian Scottish thistle pattern hallmarked solid silver nurses belt buckle. Full Sheffield hallmark with the date letter for 1898. The silver weight is 62.7 grams. This is the most desirable of all tea set trays. 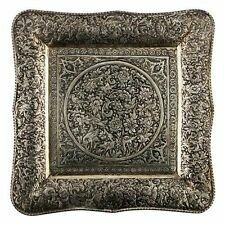 Pattern: Baroque Silver Plate( made to coordinate with Grande Baroque sterling flatware). Need other pieces in this pattern?. Maker: Wallace. A BEAUTIFUL HANDCRAFTED DRAGON ON ONE SIDE AND A BIRD ON THE OTHER, SURROUNDED. I do not claim to be an expert on every. NET AT THE BOX UNDER THE COVER IS LOOSE. ALL THESE SMALL SIGNS OF WEAR DUE TO. 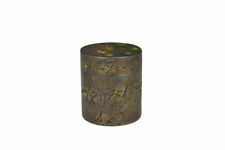 Sterling silver shot cup in the form of an oversized thimble with engine turned decoration to the body. Hallmarked on the baseFH (for Francis Howard Ltd), the Sheffield assay officeYorkshire rose mark, thelion passant for sterling silver, the date letter script"C" for 1977 and the special 1977 Queen's head mark. Weighs 54g and is 18 inches long (with fob). 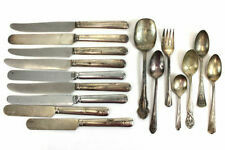 Good quality set of 8 very large Victorian Scottish sterling silver Queens pattern teaspoons. Hallmarked for Glasgow 1859 with the maker being John Murray or John Muir. Condition is very good with only very minor signs of use. You are buying 1pcs Thailand Solid Silver Bowl. 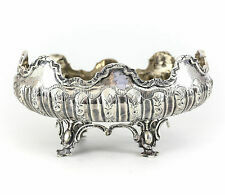 Rose Point by Wallace Sterling Silver Fruit Bowl Ruffled 10 1/4" Beautiful!. Shipped with USPS Priority Mail. Amazing price on a bowl lovingly cared for! No dents! Light scratches from in service use over the years. See pictures for accurate details on condition. Large at approximately 10 1/4 inches wide. Weighs approximately 400 grams. Nice weight! This was my Grandmother's, and I remember her using for so many things over the years. Hate to part with such a memorable item. Enjoy. Its a steal at this price! Nicely packed to your home! Hallmarked with the following: ‘HESTENES NORWAY’ and 'STERLING 925 S' on the reverse side. The length of each spoon is approx: 9.5cm. The flask is marked: "Nanking S Sterling" & has a Maker's Mark. The flask weighs 8 troy ounces, 250 grams. The flask has a screw top that's attached to the shoulder. Boyce Landeck silver clogs. CRISP HALLMARKS FOR SHEFFIELD AND SAMUEL BOYCE LANDECK. CIRCA 1900. JUST WONDERFUL TO HAVE A PAIR. Both marked 800 to base. I have only lightly cleaned them for the photos. Hallmarked with the following: ‘925’, ‘S’ and the symbol of David Andersen. The length of each spoon is approx: 9.5cm. The length of each spoon is approx: 9.5cm. Hallmarked with the following: 'D-A. NORWAY' with 'STERLING 925 S' below. Hallmarks as shown in the photos sword mark for Dutch silver. weight: 45 grams. Condition: in good order. The pepper you grind in the usual manor. It had a steel grinder stamped with the Elson design mark. The silver is assayed in London date mark for 1979 and bares the Garrard & Co mark. Amazing design with super quality combined as you'd expect from Garrard & Co. Heavy Antique Solid Silver Albert Pocket Watch Chain t-Bar & Fob Bir 1905 This one is a quality antique sterling silver Albert pocket watch chain with graduated curb links, a t-bar and a silver fob and a working dog catch. Each link of the chain is hallmarked with the lion passant sterling silver mark. The bulls eye link is hallmarked for 1905. The dog catch works well and closes tightly shut, and is hallmarked for Birmingham 1905 maker’s mark WWC. The t-bar is hallmarked Birmingham 1900 maker’s mark WWC. The middle link of the chain is stamped with the maker’s mark WWC. The fine quality silver fob has a raised empty silver cartouche. To the reverse we have a hallmark for Birmingham 1907, maker’s mark TM. Superb pair of Basting Spoons by Richard Crossley made in London in 1800, they weigh 7.5ozs and are made in the Old English Pattern. There is a crest to the handle and they have very good clear hallmarks, there are no dents, dings or repair and the Spoons are 31 cms long. This is a used estate piece in very good condition. 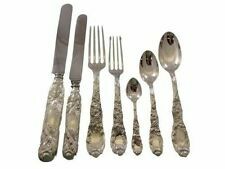 This is a comparatively rare example of a genuine pair of solid silver asparagus servers. They were specifically designed to serve asparagus, nothing else! RARE VICTORIAN ANTIQUE SOLID STERLING SILVER PAIR OF ASPARAGUS SERVERS – INTERESTING ARMORIAL CREST TO BOW - HIGH QUALITY - WILLIAM HUTTON & SONS LTD - LATE VICTORIAN ERA - HALLMARKED LONDON 1894 – WEIGHT 130g – HIGHLY COLLECTABLE – GOOD CONDITION - GREAT GIFT! It probably dates to the late 19. The flip top lid does not appear to be marked, but tests to at least 9ct gold. Personally, I think it is probably higher, due to the rich colour, but that's just my opinion based on experience. 13.1 regular ounces. very good antique condition. 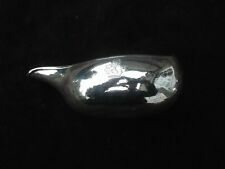 RARE Sterling GORHAM Souvenir Spoon JOHN BROWN Massachusetts ~ L. S. Stone & Co.
Sterling Silver - Gorham - Souvenir Spoon - weighs 1.02 troy ozs. Marked: with the Gorham hallmarks, STERLING, L.S. Stowe & Co. Condition - Great Condition. VICTORIAN ANT. SOLID SILVER / ETCHED GLASS CLARET JUG. HT.26CMS. LON.1872. VICTORIAN ANTIQUE ENGRAVED SOLID SILVER MOUNTED, ETCHED GLASS CLARET JUG. Total weight 1,172.9gms. Mount hallmarked for LONDON 1872, with makers mark for THOMAS SMILY. Nice hand engraved design to sterling silver mount. A great Victorian Inkstand made in London in 1888 by F B Thomas, it has a silver weight of 23ozs and is 30 cms x 19cms wide and a height of 3 cms, the two Inkpots have a crest to the lids. The glass is really clean and is cut in the hob nail pattern. Has a small chip to the edge of the bottle near the hinge inside and two. flea bites to the base. There is a black spot in the glass near the base. Full hallmark for London 1916. Good heavy weight at 119 grams. A superb antique Edwardian solid sterling silver card case hallmarked for Birmingham 1903 by Crisford & Norris Ltd. Wonderful Art Nouveau floral rose pattern that flows down the handle into the bowl portion. 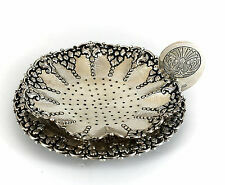 Sterling Silver - International - Tea Strainer - weighs 0.99 troy ozs. Marked: with the makers mark for International, STERLING, C1928. Maker Bogaert. The cup has a couple of small dings, but otherwise is in great condition. Pattern 3759. Condition Good used condition. There are normal surface marks related to age and use and the item may need a polish upon receipt. Condition Good used condition. There are normal surface marks related to age and use and the item may need a polish upon receipt. About this Item. Date letter: l being 1910. Everything else you need to know. Beautiflly detailed silver panel showing a hunting dog chasing a pheasant. Weight: 128 grams. Condition: in very nice dent free condition unusual for solid silver tankards. Makers mark: M&W being Mappin & Webb. A makers mark of WP being William Pugh. Date letter: m being 1810. Hallmarks: duty head mark of George III. The length of each spoon is approx: 10cm. Hallmarked with the following: ‘D & F’, Anchor for Birmingham, Lion Passant for sterling silver and the date letter which I believe is ‘N’ for 1937. Hinge opening to a gilt and royal blue plush silk velvet lining. With polished sides the box sits on three applied lion claw feet topped with Prince of Wales style brackets; the outer base with a leather cover.